Want something simple yet delicious? 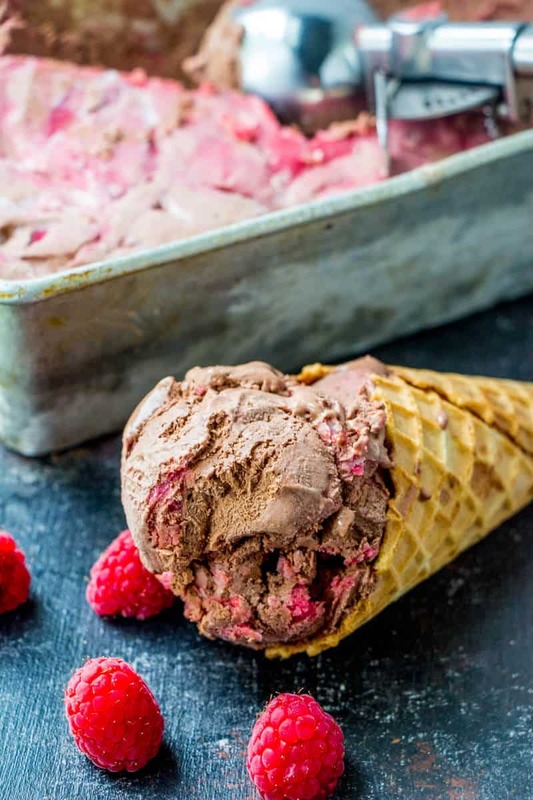 This Chocolate Raspberry No Churn Ice Cream is a quick and easy summertime treat that is full of rich and fruity flavor. If my kids could live off of ice cream they would. So during the summer months we love to make all the no churn ice cream as we can. We do have an ice cream maker but I just find making the no churn version just that much simpler! 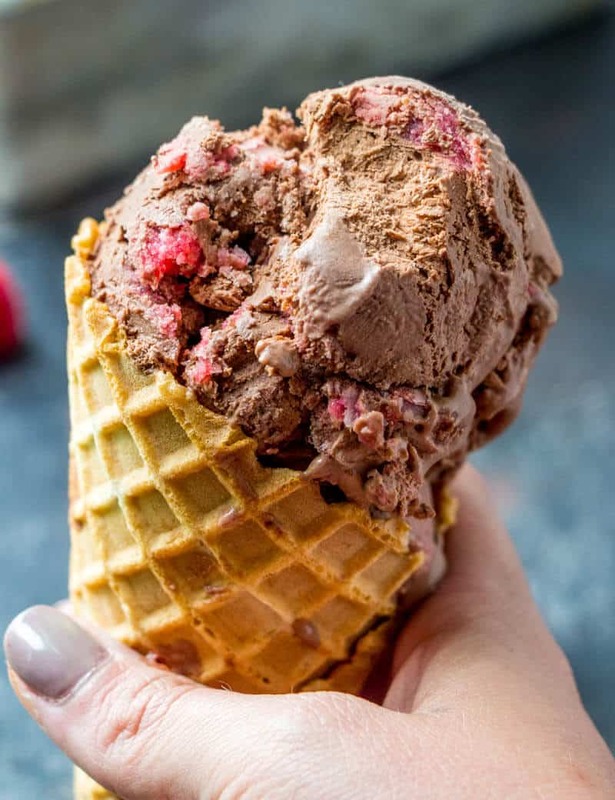 Chocolate is one of my husbands go to flavors for this frozen treat. He actually prefers chocolate ice cream with chocolate syrup, but yet sits and says he doesn’t like chocolate desserts. I call bull on that one! 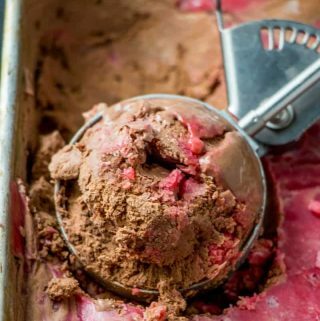 This Chocolate Raspberry No Churn Ice Cream recipe has a nice and rice chocolate flavor that is broken up with swirls of a homemade raspberry sauce that really makes this such a delicious and uniquely fun cool down dessert. WHAT DOES IT MEAN BY NO CHURN? No churn simply means no ice cream maker. This recipe can be made in one bowl and whipped up in minutes rather than in an ice cream maker that churns the mixture to freeze it then is required to also freeze for longer usually. Although this does require freezing time, it seems like it takes a lot less time than regular ice cream. 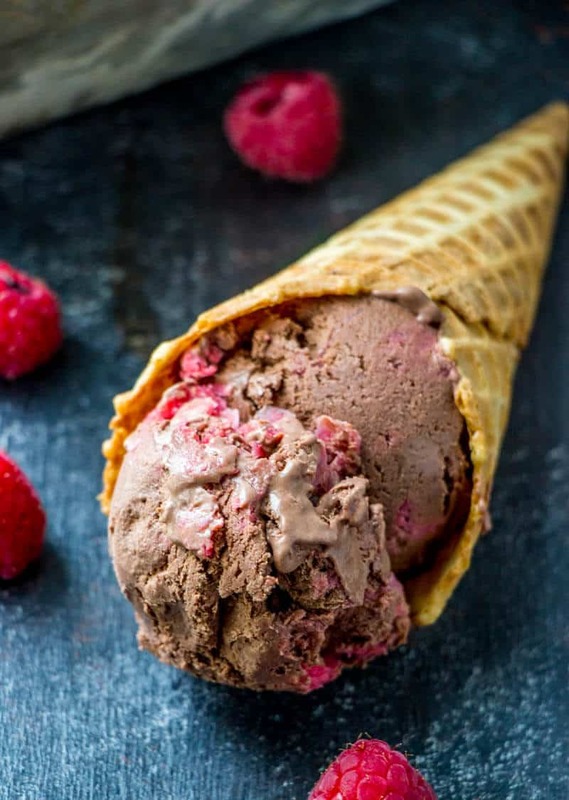 WHAT ARE THE INGREDIENTS USED TO MAKE CHOCOLATE ICE CREAM? 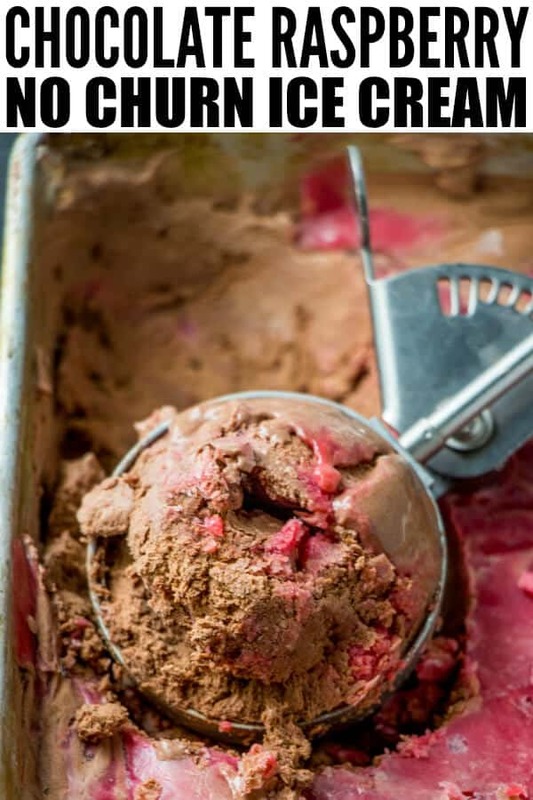 If you are wanting to make plain chocolate no churn ice cream it only requires 3-4 ingredients. So this is the FUN and easy part. To make traditional no churn ice cream you whip your heavy cream to stiff peaks and then fold in your sweetened condensed milk and add some flavoring. Now at that point you have a very basic ice cream. If you wish to make flavors then at this point you would fold in lets say cookies, fruit, candy, etc. Anything to really create the flavor of no churn ice cream that you are desiring. 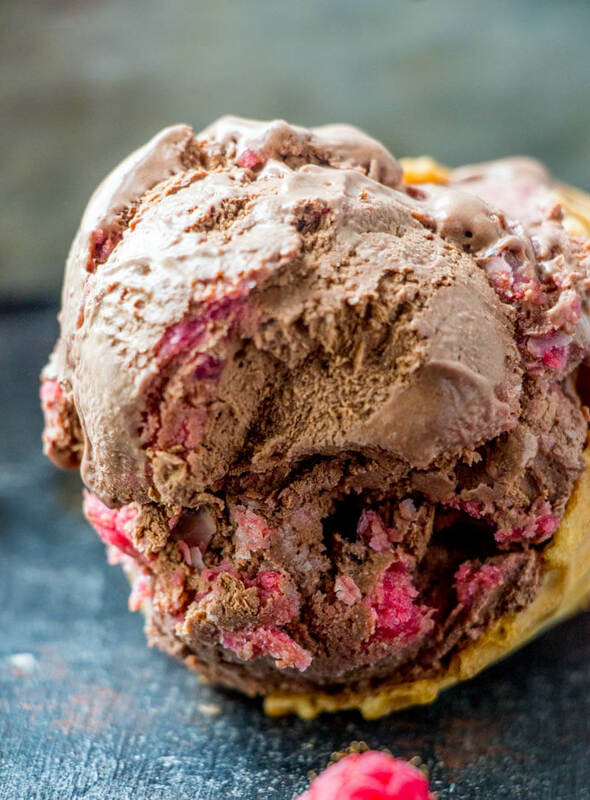 We make a homemade raspberry sauce for this version and it literally cuts through the chocolate flavor really well and give the ice cream itself a fun and unique color. 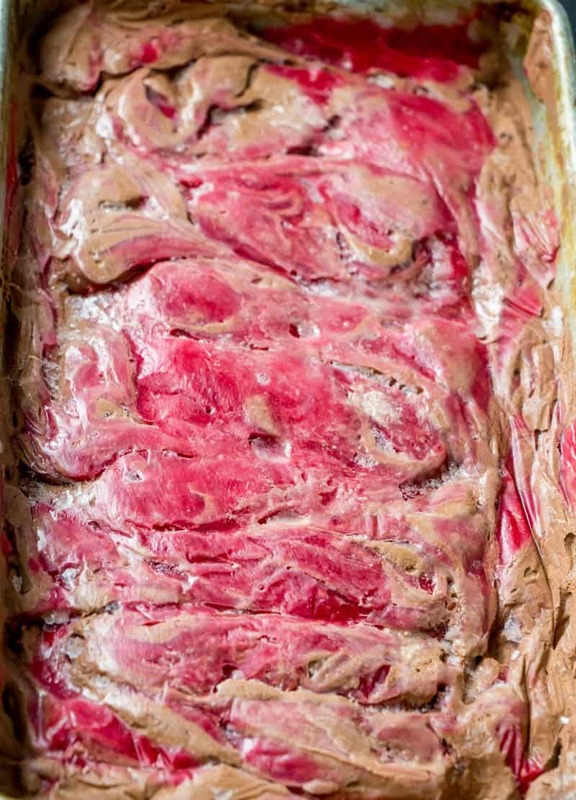 I mean I love the look of the marbling the raspberry sauce creates! 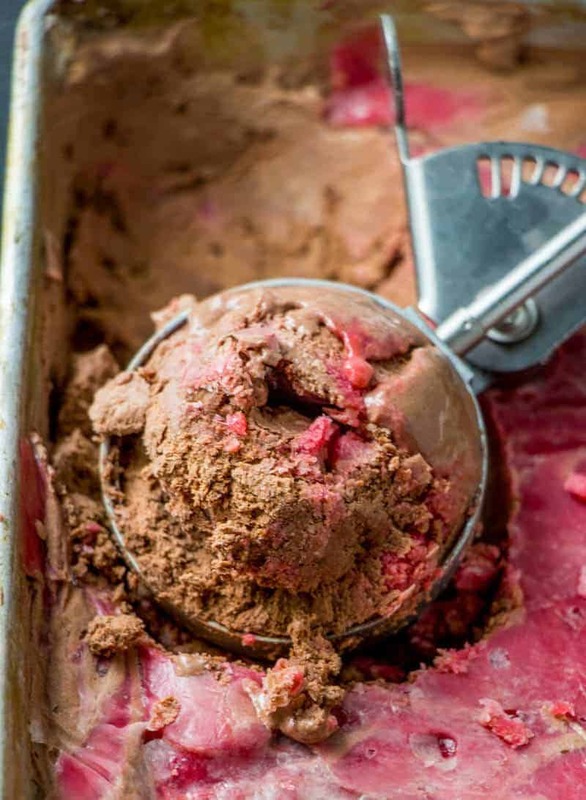 If you’re looking for a fun and flavorful summertime treat than this Chocolate Raspberry No Churn Ice Cream should be high up on your list. You’ll love how easy it is to make, and the flavor itself is enough to want to keep making it over and over again. To make your raspberry sauce, in a medium saucepan add water, raspberries, lemon juice and sugar. Heat for about 5 minutes over medium high heat until the raspberries break down while you mash them around with a spoon. Remove from heat and strain out seeds (if desired) through a fine mesh strainer. Return sauce to pan and place back on heat. In a small bowl whisk together your 2 Tbs water and cornstarch and stir into sauce for about 1 minute until slightly thickened. Remove from heat and stir in your vanilla and salt. Set aside to cool (we place in the freezer). Meanwhile, in stand mixer or with hand mixer whip your heavy cream until stiff peaks form. In another bowl mix together your sweetened condensed milk and cocoa powder. Fold your whipped cream into your cocoa mixture until combined. Spread half of your chocolate mixture into a bottom of a 9"x5" pan. Dollop half of your cooled raspberry sauce over the chocolate layer and swirl around with knife or skewer. Top with remaining chocolate mixture and spread to cover. Lastly dollop with remaining raspberry sauce and swirl around again. Cover with Saran Wrap, pressing down so the plastic touches the ice creams surface, this will help prevent ice crystals from forming. Place another layer of Saran Wrap over the top and place in freezer for 6-8 hour or over night.